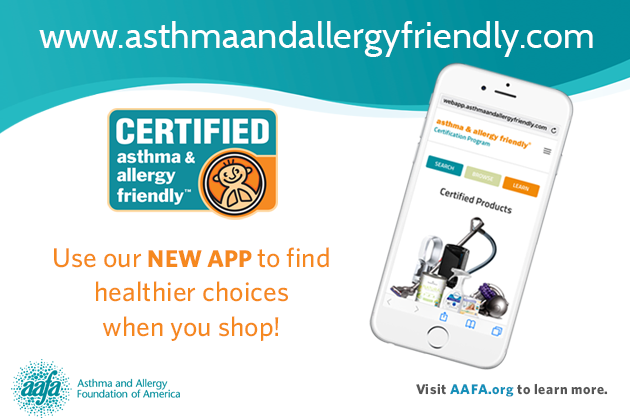 The asthma & allergy friendly™ Certification Program App Is Here! We make many decisions every day that affect our families. We second guess ourselves and sometimes struggle with our choices. Questions like, “Did I make the best decision for my family?” start to circulate in our minds. The app will help you figure this out. If you manage asthma or allergies, this day-to-day struggle can be even tougher as you strive to make your home the healthiest it can be. That’s why the asthma & allergy friendly® Certification Program has launched the Certification Program App. This free app is the first of its kind, and will help you make smart, informed choices on the best products for your family. There are so many products and services out there claiming to be hypo-allergenic or asthma and allergy free. We know that there is currently no government regulation on companies claiming to be asthma and allergy friendly. That’s why we teamed up with Allergy Standards Limited in 2006 to create the asthma & allergy friendly® Certification Program. It’s a trusted source for products and services that have been certified and proven to meet the highest standards. Be sure to download the Certification Program App, available on iOS in the App Store click here, and Android devices in the Google Play Store click here, to find products and services that are asthma & allergy friendly® Certified for your entire family. By admin|2018-08-14T14:20:44+00:0019 December 2016|Comments Off on The asthma & allergy friendly™ Certification Program App Is Here!